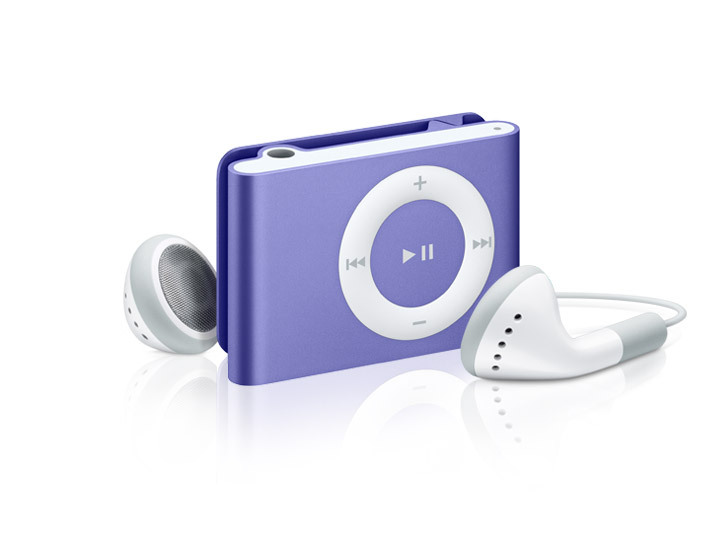 I go to a gym four to five days a week to workout, and my constant companion is my iPod Shuffle. 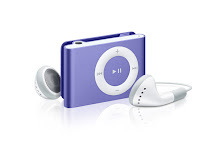 I've been listening to the same workout music since October, and it is getting too predictable, so I was glad to find a source for some free workout music. These three free workout mixes (higher bpm) are available for a limited time (In fact, I think one is only available today and tomorrow.) I don't like all the songs, but they will add some variety to my workouts. 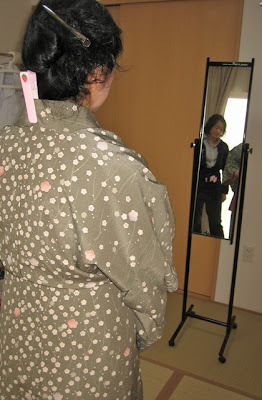 It is time to get out of our kimonos and wear comfortable clothes again. Some of Nancy's future Foreign Fridays will feature signs and labels from my recent trip to Japan. Since my husband and I don't know the Japanese language, we depended 100% on our hosts and the signs to explain directions. 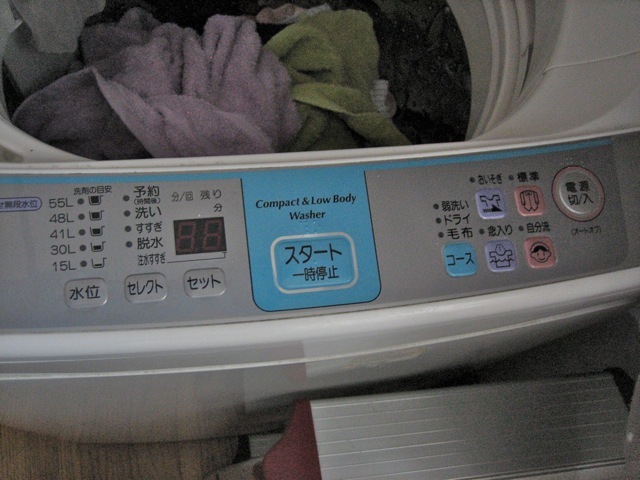 Today's photo shows why I didn't do my own laundry while in Japan. Would you know how to use this washing machine? • More of Sheila's photos will be featured in future Foreign Fridays. This map is too cool not to share. Note that the brighter the lines, the faster the wind speed. 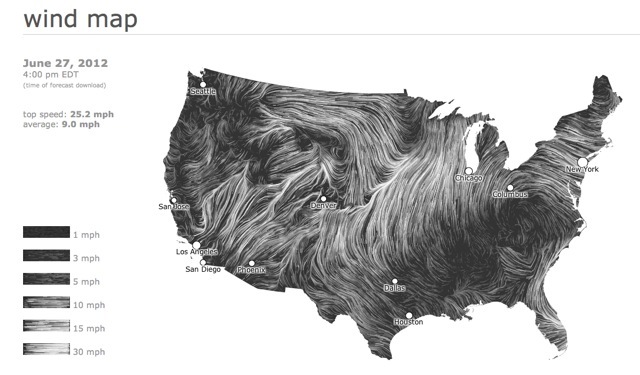 The current map in motion can be found here. On the website, check out the information below the map, especially the "Gallery" section. 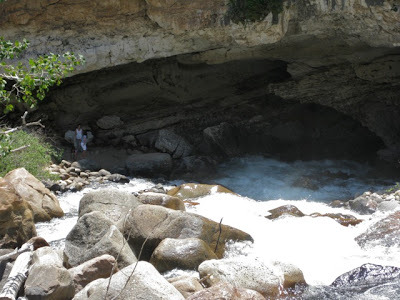 Last week, I joined two friends (Sue and Louise) for a picnic in Sinks Canyon. We had a good time visiting and sight-seeing. 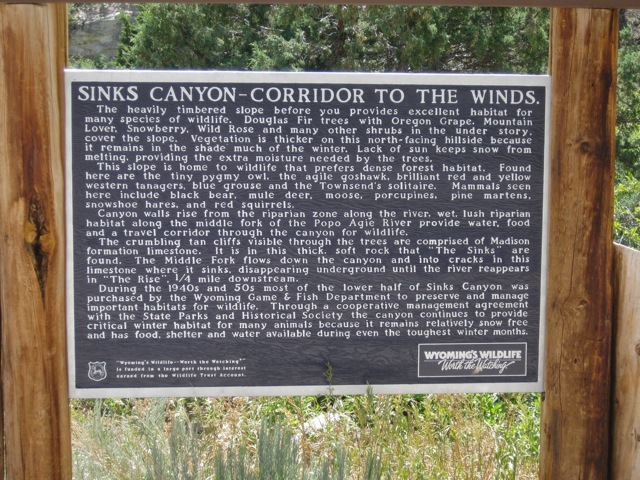 Two of the most visited areas in the canyon are "The Sinks" and "The Rise." The Sinks, pictured above, is where the river disappears under the mountain. Note the people standing on the left in the photo. At flood stage, that area would be under water. The power of the water over the years has eroded the limestone, creating the cavern. What makes this area so unique is that the river surfaces a quarter of a mile away on the opposite side (the north side) of the road in an area called The Rise. All of the river's rage is gone at The Rise: the water is crystal clear and is the habitat of giant rainbow and brown trout. The river returns on the north side of the highway. also flows from the entire north mountain face at this point. 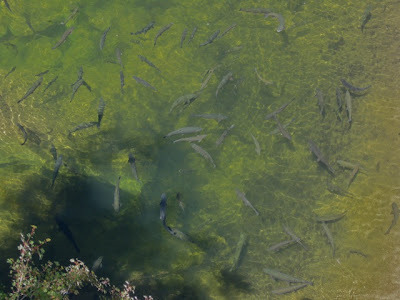 The rainbow and brown trout are approximately 3 foot long. Sorry, no fishing is allowed on the north side of the highway. 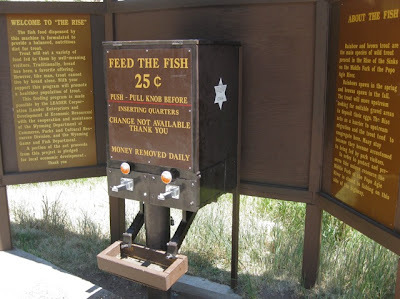 When I was a kid, we used to bring stale bread here in the summers to feed the trout; however, that practice is now discouraged. 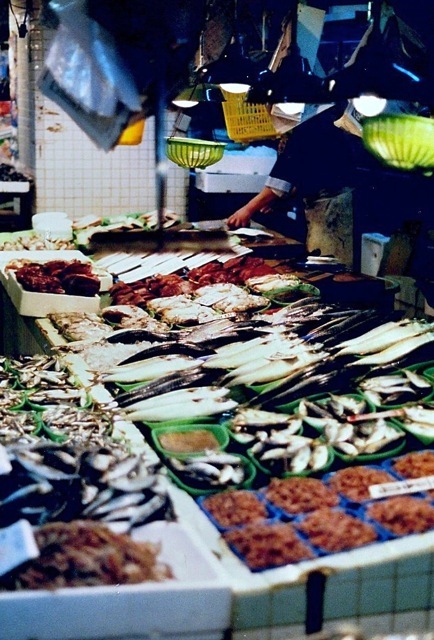 In order to keep the fish healthy, the Game and Fish suggest throwing food pellets, which are available near the viewing platform. I shot some video of the area on Friday. The river is loud so you may need to adjust the volume. 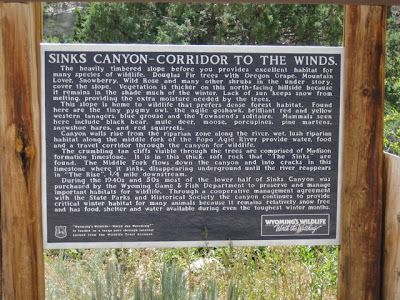 If you are ever in the Lander area, please add Sinks Canyon to your itinerary. You will not be disappointed. Don't forget to bring some quarters to feed the fish. 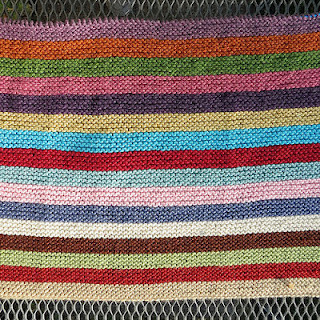 I used the empty needles from Three Bears to start a new blanket for the Western Region Oddball Knitting group that I've named Inchworm. 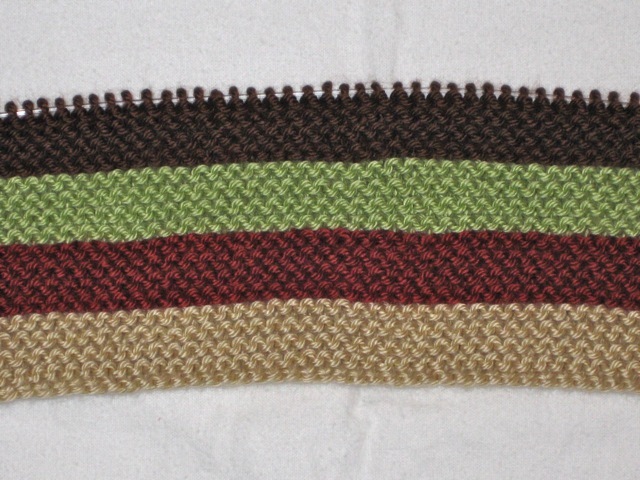 Each knitter's section will have four, one-inch segments. 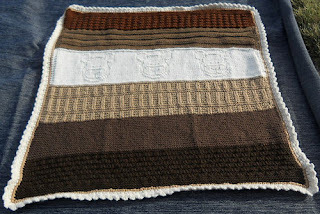 The segments will use small scraps we all have from working on previous blankets. The garter-stitch blanket is being knit with 120 stitches on size 8 needles. Four Western Region Oddball knitters have added sections. Two more sections will be added. 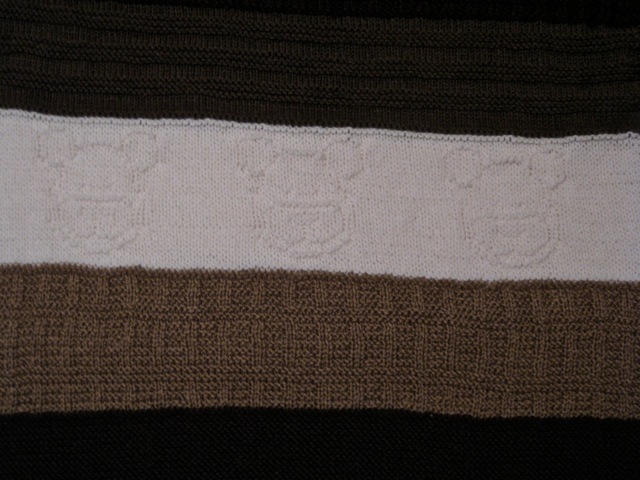 This is a delightful blanket, and the three bears in the cream section are certainly cute but very hard to photograph. 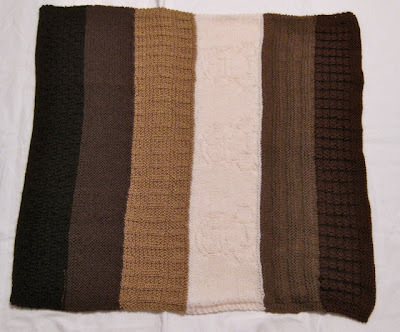 I knit the last section on the far right in my favorite Checks and Ridges stitch. 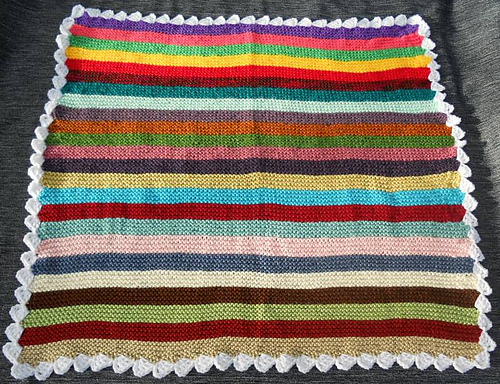 The blanket was knit with 120 stitches on size 8 needles. Last week, I made a road trip with two of my knitting buddies. The trip was a short one, only 40 minutes from home, but it took us to another world - a world filled with adventure, intrigue, romance, and locations that only words can create. 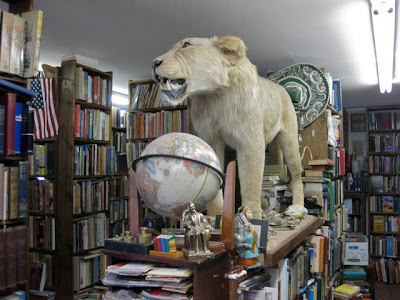 We entered the world of Mad Dog and The Pilgrim, two local women, who sell books mostly online, but they also sell to those who happen upon the large barn near their home. This site explains why they relocated their business from Denver, CO to isolated Sweetwater Station, WY with a population less than ten people. Yes, you read that correctly - less than ten individuals. 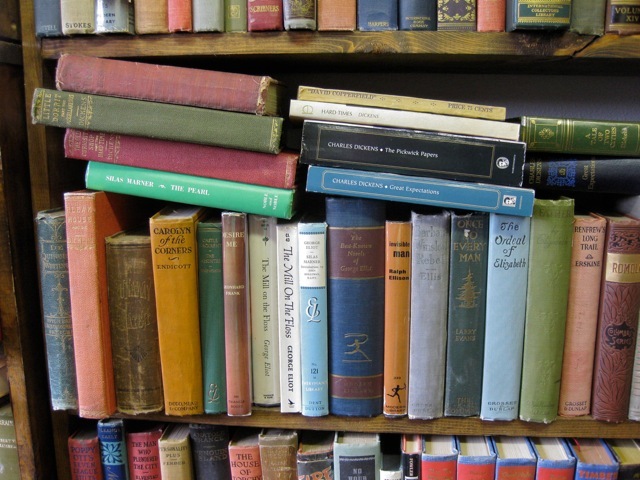 In the barn, books of all sizes and ages are on display as well as packed in boxes. 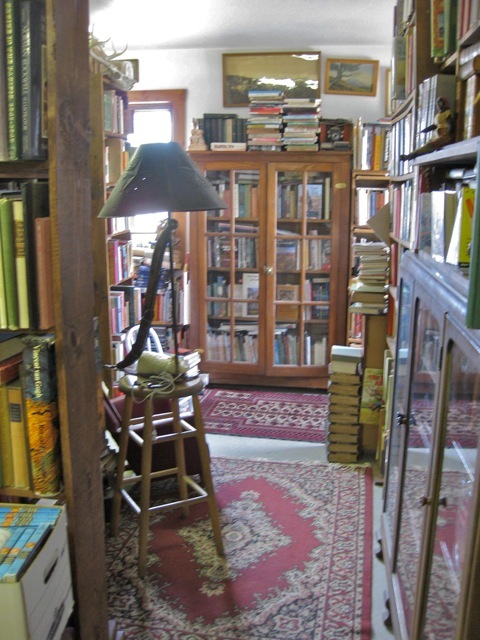 It is book lovers' heaven. Around every corner is yet another area with even more books, beautiful antique furniture, a variety of paintings and prints as well as oddities. 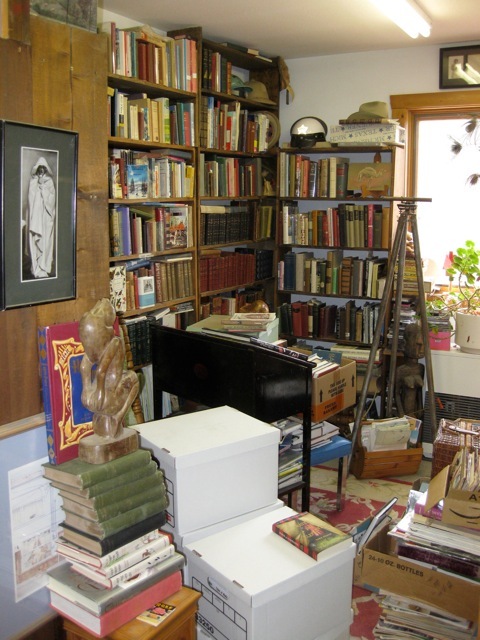 History books and biographies can be found in this section of the barn. Up stairs is a collection of fiction, religion, and philosophy. 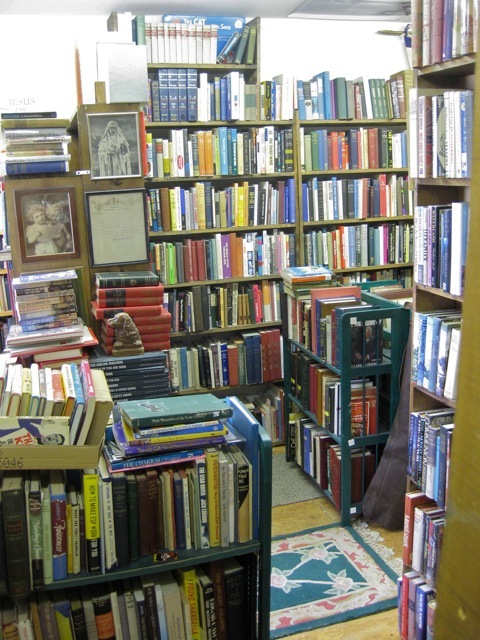 Tucked in the shelves are even first editions and signed copies. 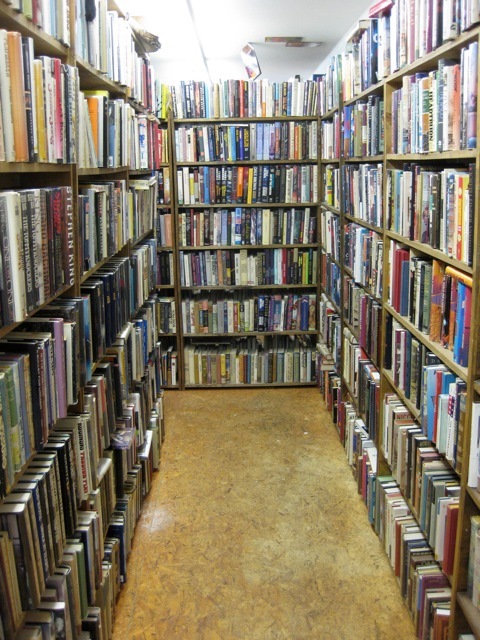 For the casual shopper, the sight of all the books is nearly over-whelming. Cheryl and Sheri compare their height to "Moses." Polly Hinds, aka "The Pilgrim," was quick to assist in finding specific topics and/or books. Note the sign on top of the counter: since the shop is on a working sheep ranch, no one may be in the store when customers arrive. A bell on the gate alerts Polly and Lynda that someone has stopped by either for a visit or to browse for some books. I found a delightful volume of short essays, an Amish cookbook, and a historical account about the Tie Hacks in the Dubois area. Cheryl found a One Skein Wonders knitting book. 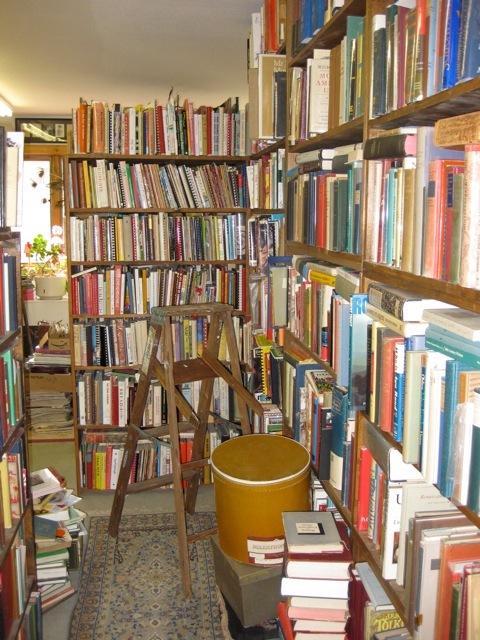 The prices were very reasonable, and the books are in excellent condition. 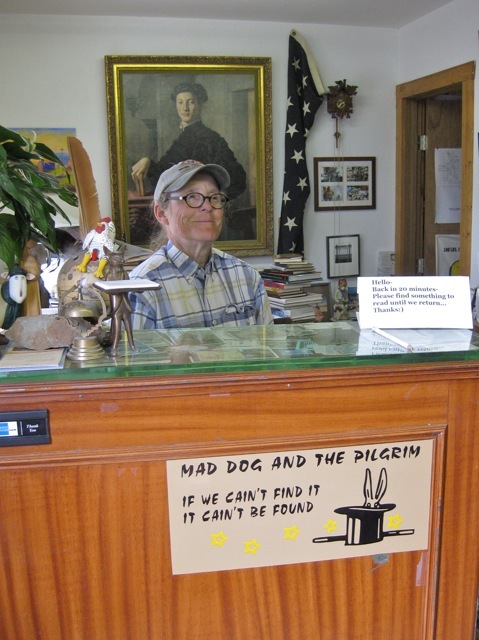 If you are looking for a specific book, I urge you to contact Mad Dog and The Pilgrim. As their sign states, "If we cain't find it, it cain't be found." 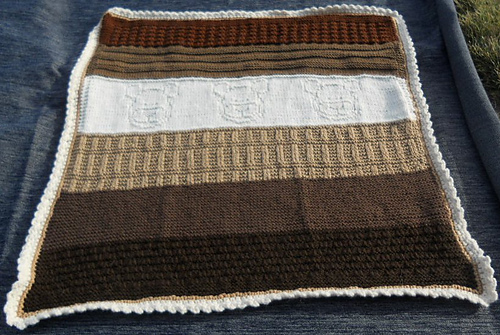 Garden Vegetables, a Western Region Oddball Baby Blanket, was started by my knitting buddy, Cheryl. Her section, a deep purple, represents eggplant; my section, peas. 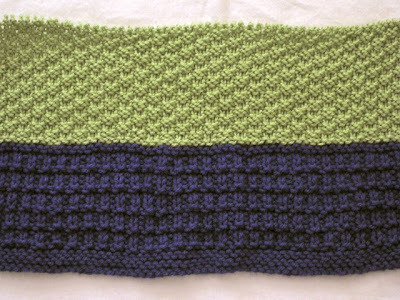 I used Caron Simply Soft and the Box Stitch for my section. 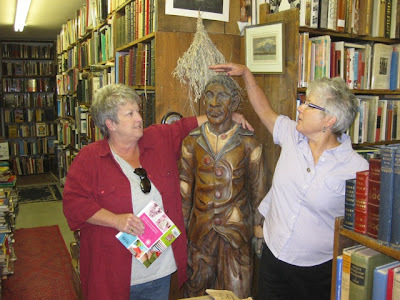 While Marilyn and I visited at a lot of quilt shops on our trip, we also browsed antique shops. Marilyn was looking specifically for old beer signs for her husband, and I searched for vintage linens. Call me old-fashioned, but I use scarves on my nightstands, an antique buffet, and an antique dresser. 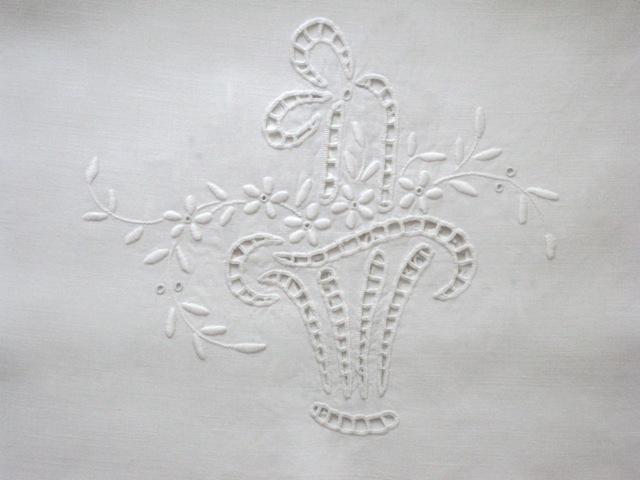 I found some wonderful pieces for very reasonable prices. 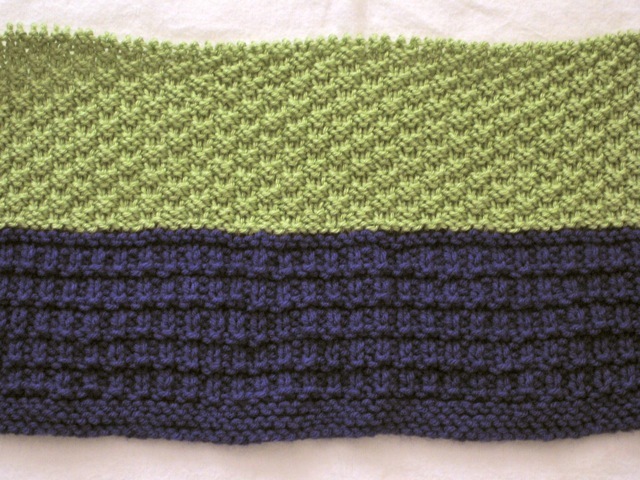 It was the six-inch crochet on each end of this linen scarf that caught my eye. Even though the piece had some yellowing, I knew the $8.95 price was a steal. After a good wash, most of the yellowing has disappeared, and the scarf fits the buffet nicely. 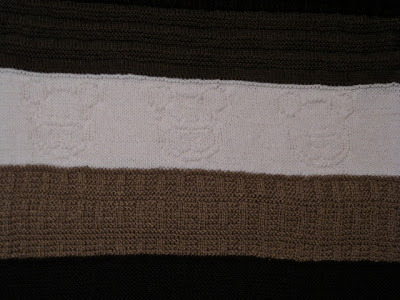 Because of the two doves, I think this scarf was a wedding gift. The linen and lace are in excellent condition, so it was probably only used for special occasions. 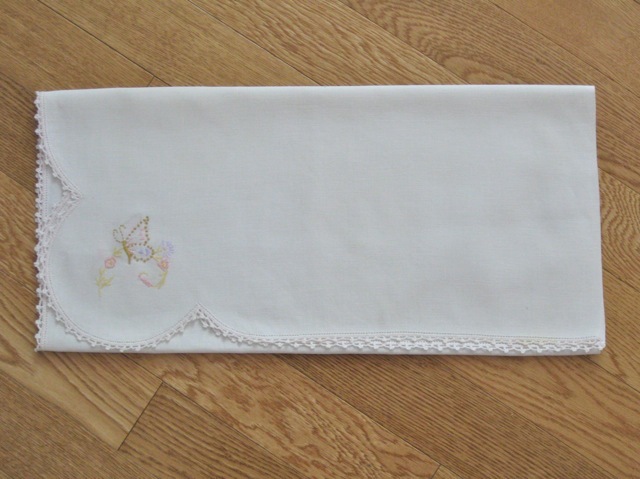 This scarf has a delicate edge and minimal embroidery in the corners. The untrimmed edge is the fabric selvage. It fits the dresser well for $2.95. 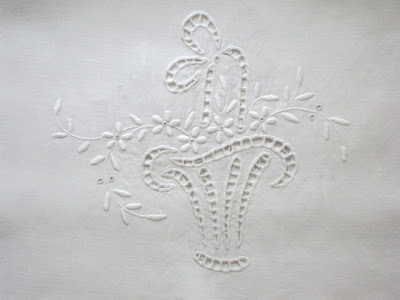 I love this embroidered and cutwork piece (detail shown above), and the $2.95 price made it even more appealing. Even though some of the cutwork is loose, I love the scarf. It fits the dresser and the buffet. 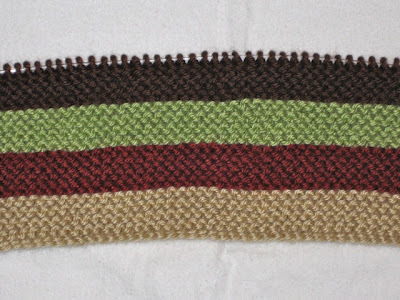 It was the scalloped edge of this scarf that caught my eye. 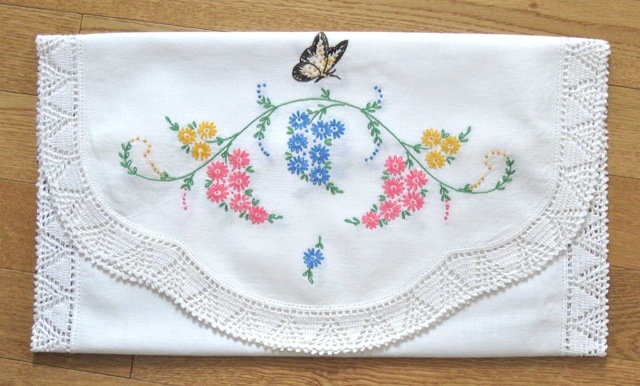 From the colors, I'm sure it was embroidered in the 1960s or 70s. It fits the dresser and cost $4.00. 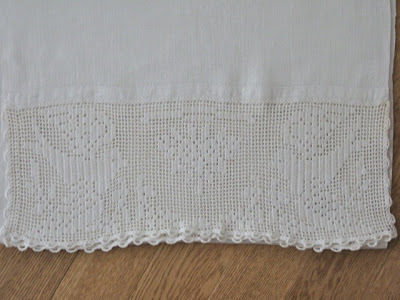 This is another "newer" vintage scarf, but I love the lace edge. It also was $4.00 and fits the dresser. Yes, I know old ladies use handkerchiefs, but with allergies, I'd go broke buying tissues. 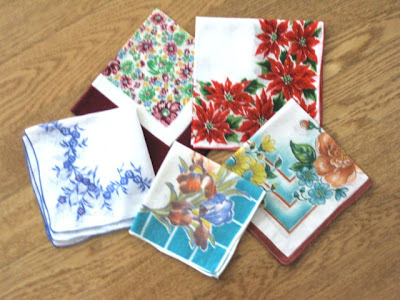 These handkerchiefs were $1.50 each and are handy to carry in a pocket or purse. One bonus: they will not fill my washing machine with tissue lint if I forget they are in a pocket. 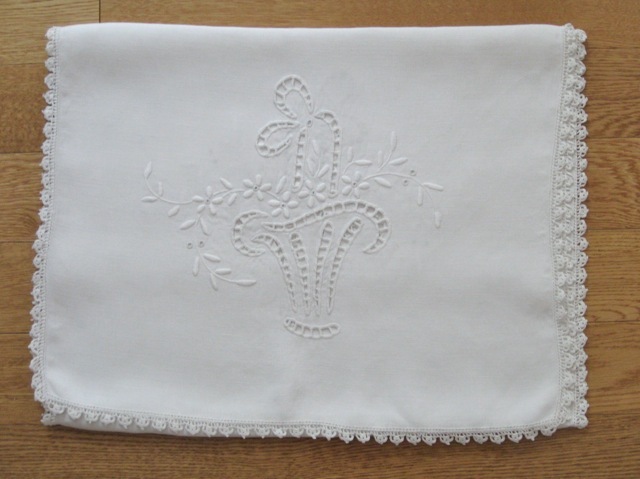 I saw many with lace around the edges, but I refused to pay $5.00 for a single handkerchief. A small group of fiber guild members met in front of the old Lander library to knit in public. 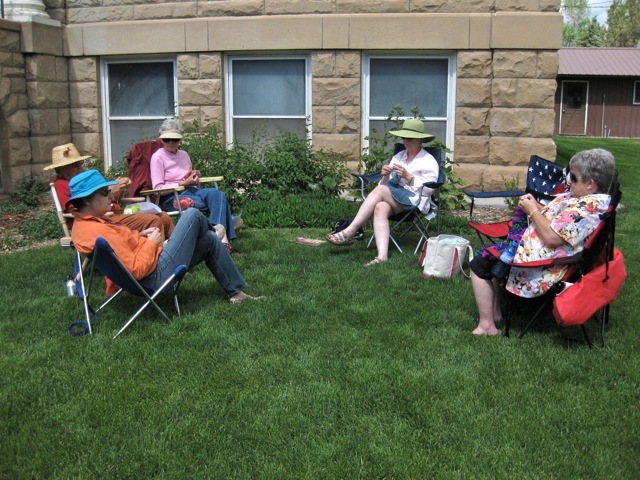 While the location was off the beaten path, we knit and visited from 10AM until nearly 2PM. 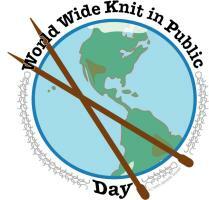 Where did you Knit in Public this year? Last week, Sheila N. shared her kimono dressing experience. This week features her husband, Doug. For more information about their recent trip to Japan, check last week's post. 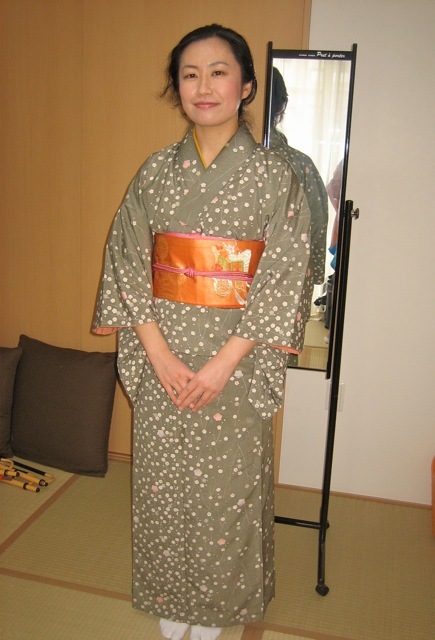 Thank you for your nice comments about last Friday's kimono wear! I am glad you enjoyed participating in this experience. 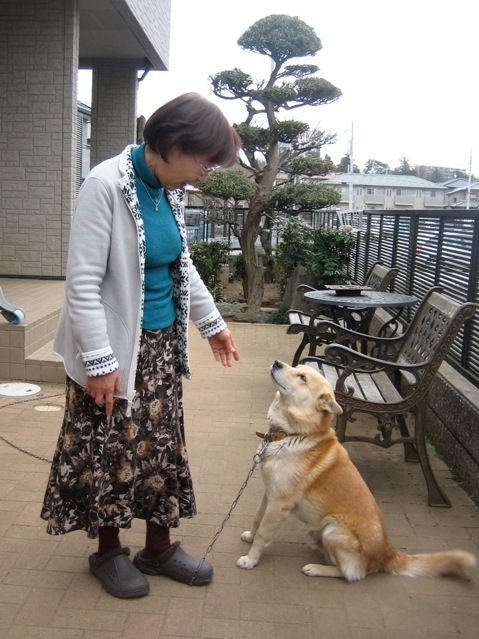 Today we have photos of our friend Tamami who lives in Tokyo. Doug and I met her when she was a student here at Central Wyoming College. a green kimono which belongs to her mother. used to measure and to temporarily secure items. 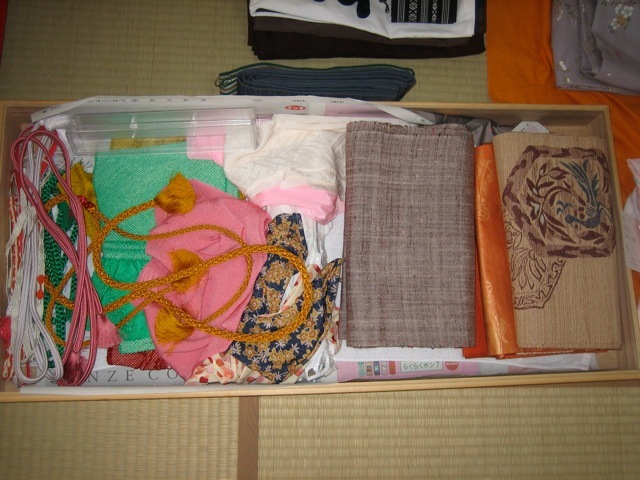 This bin contains the under kimono garments for Tamami. See last week's post for more detail. 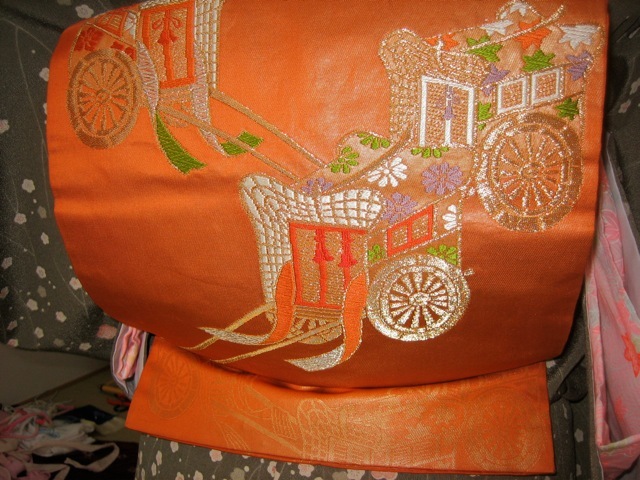 Tamami's obi has an intricate carriage design. Tamami fully dressed in her kimono and obi. under garments. Note the tatami mats on the floor. 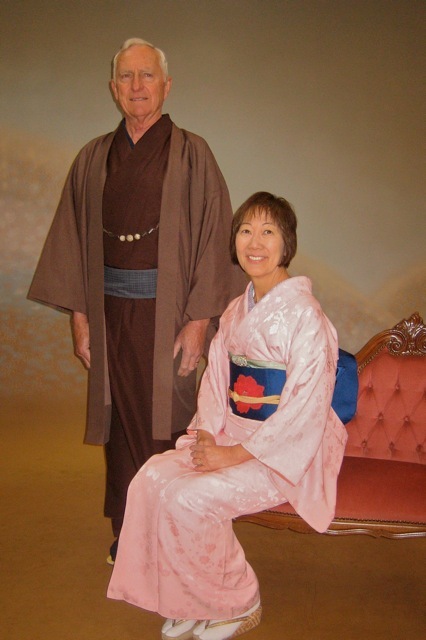 My husband-Doug was a good sport to also wear a kimono. I don't know what men are supposed to wear before the women dress them, but fortunately he had a white T-shirt and some white slacks, so that's what he wore, and they put only two layers on top of that. He held still for a much longer time than what it usually takes him to get dressed. First he put on socks like those described last week. He wore a white undergarment with a black collar, and over that the dark brown kimono, then a narrow greyish belt, tied a certain way. 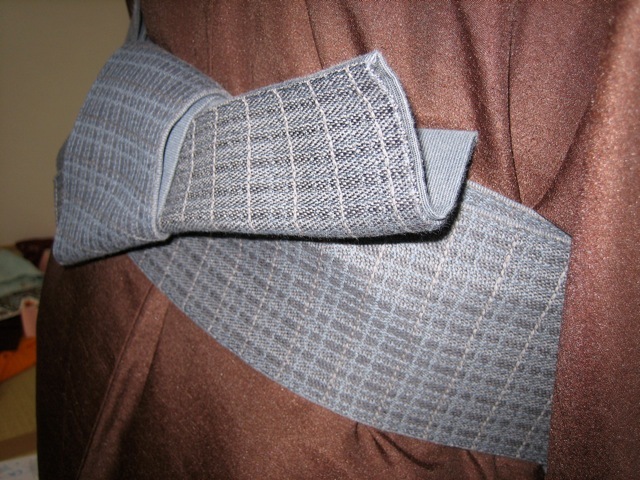 I think this is also called an "obi." Adjusting Doug's kimono and belt. Note how different Doug's obi is tied. 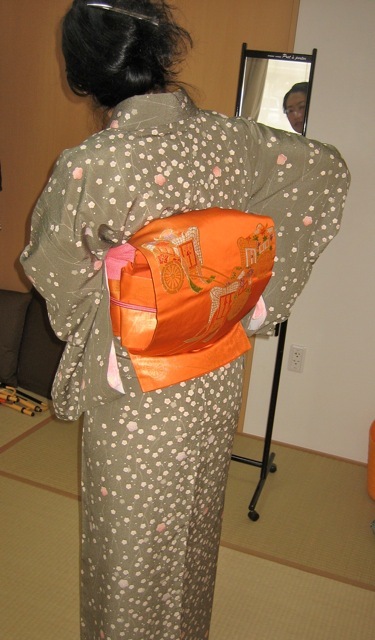 Doug's kimono had beads in the front, most likely for decoration. 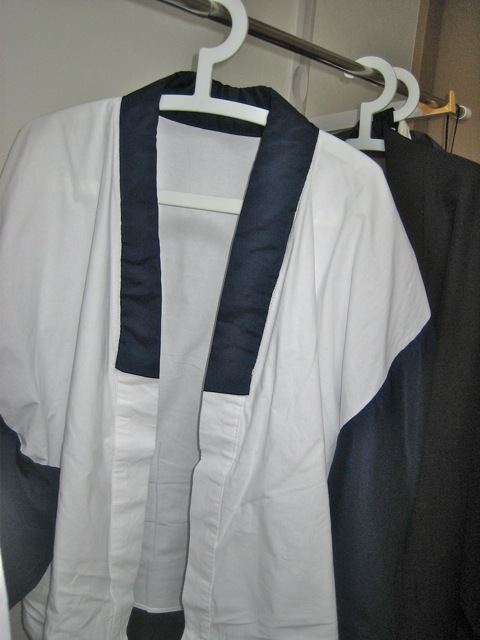 The men's obi's are always narrower than the women's. 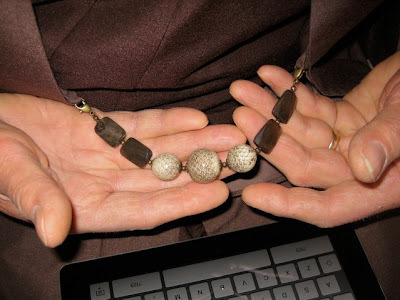 Instead of a very thick, long, decorative obi, the men get to wear the beads-- pretty, aren't they? They have to be adjusted a certain way. The last item is the light brown "jacket." 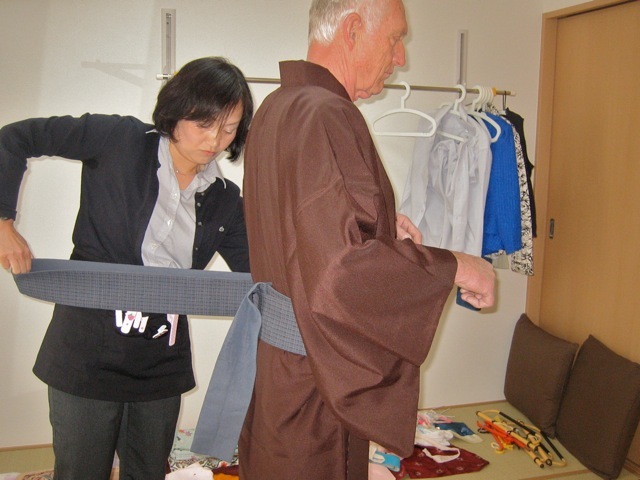 Then he put on his special ordered geta (extra large size, compared to most Japanese men's small feet). 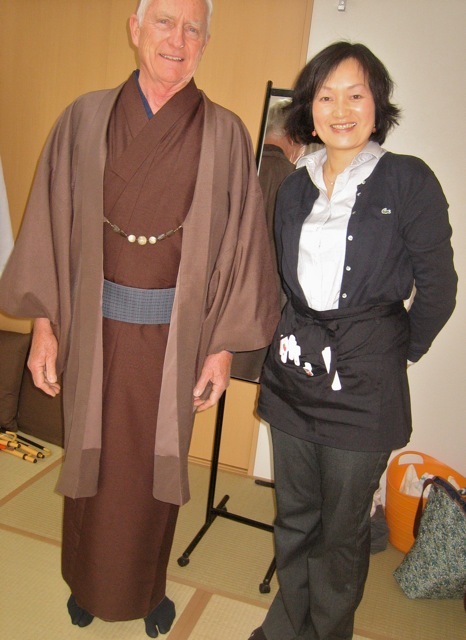 Doug N. and kimono dressing teacher. are ready for the next adventure. Tamami said we all looked so nice that we should go for a walk outside. We didn't know where we were going, but about a block away was a nice little photographer's studio. It was fun to pose for pictures--haven't done that since high school graduation, ha ha. 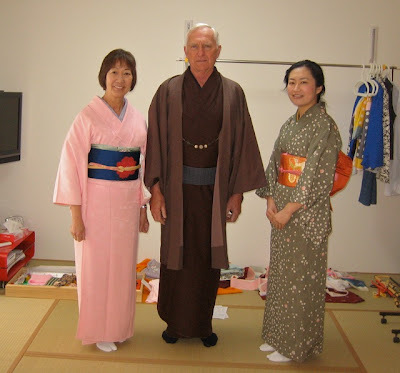 Since we don't know any Japanese, the photographer had to keep coming up to us and physically tilting our heads, straightening our feet, adjusting our collars, and moving our arms. As we left, she went out to play with her dog, a Shiba Inu, a very common breed "made in Japan." I pointed to the dog and my camera, and she understood that I wanted her to pose for me this time. You can see how cute she and the dog are. We exchanged gifts with the kimono teacher. 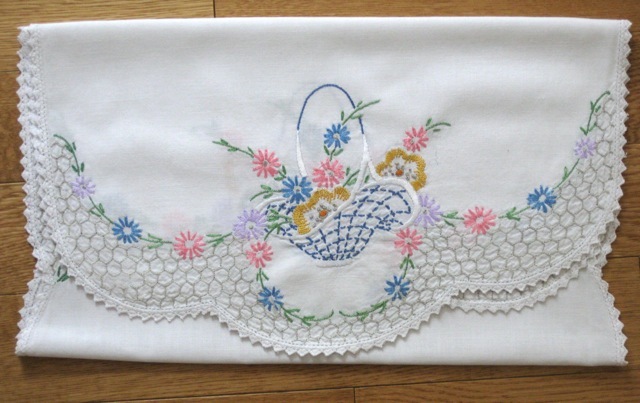 People in Japan always exchange gifts whenever they are a guest in someone's house, or whenever someone does something for them. I think I gave her some postcards and a pin from Wyoming, and she gave us some fancy paper napkins that look like silk. Thanks again for your comments and questions. Thank you, Nancy! Sheila has promised to share more photos and experiences in future Foreign Fridays. It Saddens Me To See. . .